In the book Finish by Jon Acuff, he argues that “perfect” is the enemy of “done.” He gives example after example of “perfect” talking you out of starting or continuing with your goal, because it would not be good enough. This is right on. Think about all of those new exercise plans. You start off like a ball of fire. You work out each and every day for a week or two. Then you miss a day. Then you fall completely off the wagon and give up. We have all been there. That’s why Jon says that one of the most important days is “the day after perfect.” It’s actually easier to keep things rolling when you are on track. But the moment you get off track, “perfect” convinces you to give up completely. I bring this up because it’s part of the reason I was able to convince myself to do this blog every day. I know that in order for Google to find a blog post in it’s algorithm, the post has to be at least 300 words. When I learned that, I felt like every post had to be 300 words, or what was the point? That was “perfect” talking. These posts (and any writing for that matter) needs to be as long as it needs to be to get the point across. No longer. So I gave myself permission at the beginning of this journey, that if the post was not 300 words, it was totally okay. It still counted. It was more important for me to show up every day. If I did that, the rest would take care of itself. So stop letting “perfect” talk you out of doing. Make a deal with yourself. 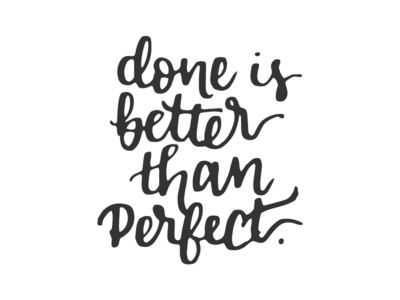 As Jon Acuff would say, it will help you give yourself the gift of “done.” Finish is a great book (and a great audiobook) and you can find it here. And if you want to make sure you never miss an update, you can sign up for our VIP newsletter here.